Complaints about legal writing, like billable hours, just keep mounting. This book seeks to solve the problem of lack of understanding by a two-stranded approach. In his 1936 article 'Goodbye to Law Reviews' in 23 Virginia Law Review 38 at page 38 Fred Rodell pertinently and memorably remarked: "There are two things wrong with almost all legal writing. One is its style. The other is its content." For the many who have been oppressed by legal writing that it nigh impossible to understand Fred Rodell has said it all. Complaints about legal writing, like billable hours, just keep mounting. To adapt the phrase from Phillipians 4:7, much legal writing 'surpasses all understanding'. This book seeks to solve the problem of lack of understanding by a two-stranded approach. First, it contains a general account of the skill of writing. The three vital characteristics of good writing are structure, structure and structure [something that the apostles of plain English tend to overlook). This cubic requirement for structure delivers the most prized of all outcomes, clarity. Structure does this because it connects. Each word, phrase, sentence and paragraph connects with the one before and the one after. This makes a text readable because it flows, almost effortlessly, down a path paved with simplicity. 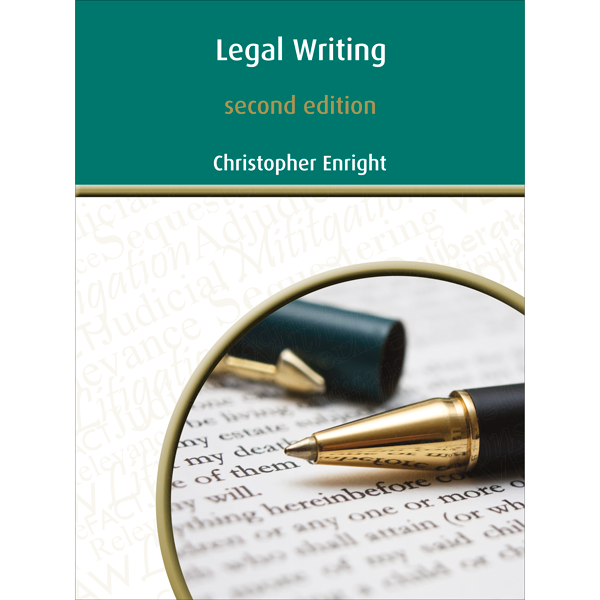 Second, the book explains the essentially legal component of legal writing. This derives from the various models for working with law. Legal writing involves describing some task for working with law [ even if the task is just organising law in order to write about it). This allows a simple technique for clear writing - adapt the method for working with law so that it becomes the structure for writing law. Christopher Enright is a chartered accountant, barrister and solicitor. He has lectured in law at several universities. He specialises in legal method. The purpose of this book is to state the major principles of constitutional law in a simple and straightforward manner. It is designed as a first reader in the subject prior to attacking the intricacies of federal constitutional law later in a law course. This book describes a structured approach to legal research consisting of 12 steps. The idea is to present a step by step approach to legal research that is as foolproof as human endeavour can make it. Vast numbers of statutes rule our lives. Many of them are not easy to read. Parts of some are almost impossible to read. This book sets out some ways of drafting statutes that makes them easier to read. This book starts from the ground up to explain the logical structure and function of a privative clause. It then considers in a critical way the reasoning of the High Court. It points out aspects that need further attention because the court’s reasoning is unsatisfactory. It also points out relevant legal considerations that the court has so far overlooked. The skill of interpreting a statute is important for one good reason – the outcome of a case commonly enough depends on how a court interprets an ambiguous provision in a statute. Yet despite the importance of interpreting statutes there have been no serious attempts so far to describe an effective method for performing the task. Lawyers tend to be skills averse. They absorb some way of performing various tasks with law but without explicit or proper instruction. This lessens their ability to learn law as students and to work with law as legal practitioners. This book aims to rectify this problem. Little attention is paid in law schools to the reasoning processes for proving facts. This book seeks to rectify this problem. It contains a four-step model for proving facts. There are numerous sources of law in Australia, which possesses sixteen legal systems, being the Commomwealth, six states and nine territories. The purpose of this book is to explain the nature of the sources of law used in these legal systems. This book explains the task necessary for trial advocacy for a case based on a dispute of facts. The primary purpose of this book is to provide law students with the text of constitutional legislation and documents. Law students need these in several types of courses. The obvious courses are introductory law courses as well as public law courses on constitutional law, administrative law and human rights. The aim of this book is to provide an array of exercises that assist students in understanding the Constitution of the Commonwealth of Australia. This book explains how to answers a problem question. It does this by providing a model. Naturally this model incorporates advice on how to perform the four fundamental skills that are needed to answer a problem question. Legal education pays little attention to ambiguity. This leads to neglect of two important aspects of ambiguity. This book explains an effective method for interpreting the object and meaning of statutes of law. This book explains an effective method for efficiently organising the elements of law and litigation, and describes how these are related to the facts and consequences of a case. Proving facts in court is an uncertain business. This book describes a model for proof of facts to throw some light on the subject and to make the task more systematic. Common law is a messy beast. This book seeks first to analyse and explains it and enable readers to work with common laww more effectively. This book covers the essentials of clear writing techniques and teaches skills on how to plan for and perform well in examinations.